Win this app October 11th, 2015! I found this app refreshing. It made me want to bake apple pies, start my own backyard garden, and learn my colors all over again. Grandma’s Garden not only nurtures the child’s interest in gardening but it teaches shapes, colors, counting, matching, sizes, and letters. 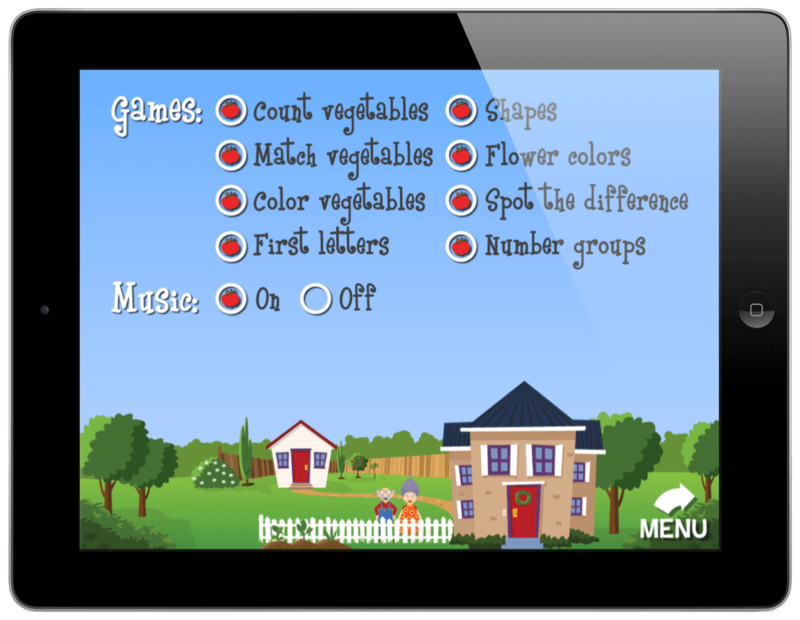 It is a preschool learning app with a wide range of educational activities for kids. The mini movies that are found within the app are darling and helpful. They help apply the principles of gardening to everything they have learned. Both of my boys that are 5 and 3 loved this app and couldn’t put it down. One of the best parts is Grandma’s voice. She is calming and gives a fresh take to learning through technology. Fairlady Media is the developer of this app. They are committed to creating fun and family friendly learning games for children. 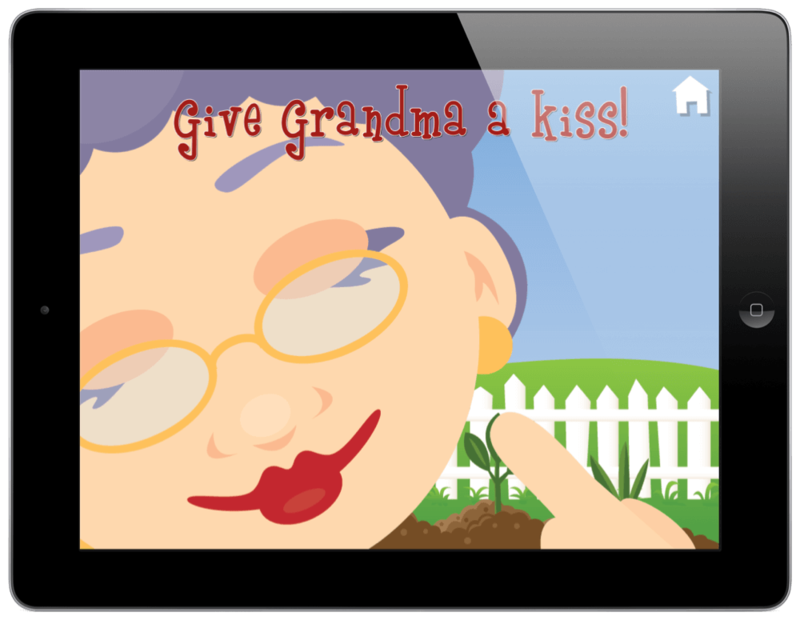 They have many different Grandma and Grandpa apps available with many different themes and learning activities. You can check out more on their website at Fairladymedia.com. When you open the app, you have 3 options. 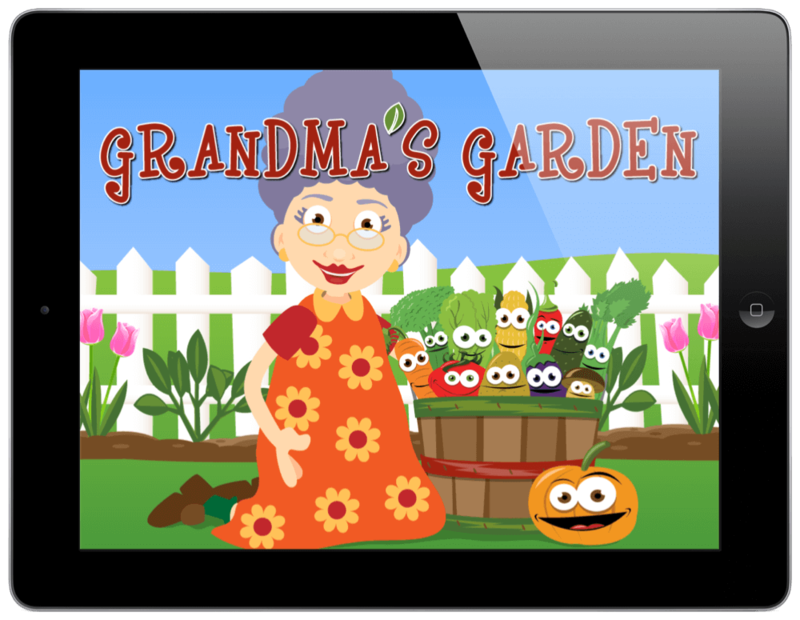 You can play the game, change the settings, or view more options about Fairlady Media, which is the developer for Grandmas Garden. This app is very simple and easy to navigate. You will not have a hard time figuring out how to use this app or how to help your child. It is very easy to understand. When you play the game, you will go through many fun learning questions and activities. You might be asked to choose the watering can with the heart shape on it to water the vegetables or to pick all of the white flowers. As you complete the activities, praise and incentives will be offered. You may even get Grandma to clap or dance. This app focuses on positive reinforcement. If the child is asked to choose white flowers, and they choose a pink one instead, Grandma will simply say, “that’s pink” which will encourage the child to keep trying. It is all about learning, practice, and praise. In the settings menu, you can customize which learning activities are shown. If you don’t want your child to learn about colors because it is too challenging right now, you can turn the color activities off. You can also turn the music on or off. The settings are very simple and basic but they cover the needs for the app. There are parent controls set up for the “Settings” and the “More” tab. There are also no advertisements in the learning activities so it is very safe. In the “more” option, you will need to unlock the parent controls and then you can see the other apps from Fairlady media, you can rate the app, send feedback to the developers, and learn more about the privacy settings. Probably my favorite part within the app are the video clips.They are only a few seconds long but they teach about various gardening subjects including compost, growing seeds, strawberries, and more. They are rewarded as you go through the learning activities and will spark the interest of any mini green thumb boy or girl. I would definitely recommend Grandma’s Garden to children ages 2 through 6. The activities included are simple but there are a lot of them available. It also gives a fresh take because of the gardening theme and grandma’s voice. I love that you can customize which activities are made available within the settings. This will help children who do better focusing on one subject at a time or children who struggle with a particular skill. I would love to see even more movies about gardening. I also would suggest adding more incentives to the game. You get to take a prize out of grandma’s bag from time to time but getting to play with the item on the screen somehow or use that incentive would be helpful. Either way, this app should be a parenting staple for a preschooler. Be sure to enter the giveaway on the Touch Autism Facebook page and purchase Grandma’s Garden today! 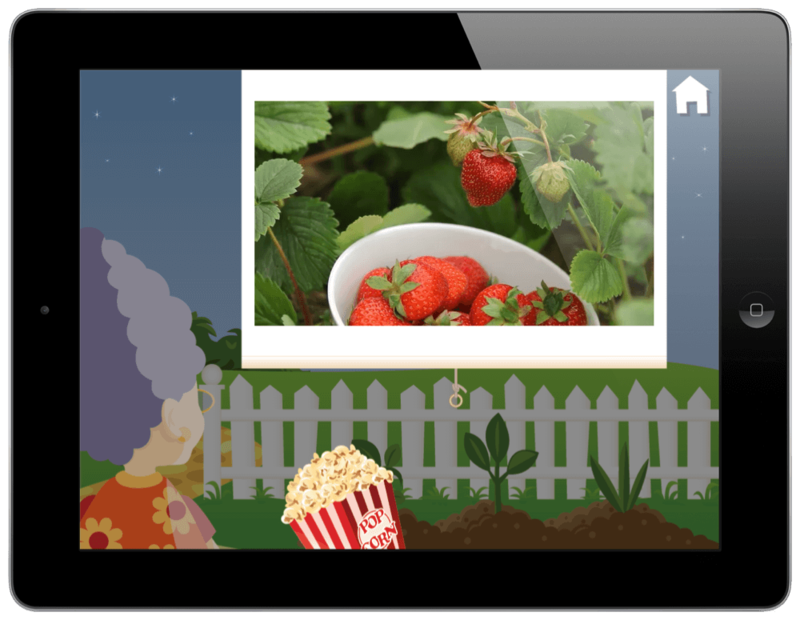 Fairlady Media is committed to creating fun and family friendly learning games for children. They have many different apps available for kids. Grandma’s Garden cultivates an interest in gardening while teaching all things preschool. 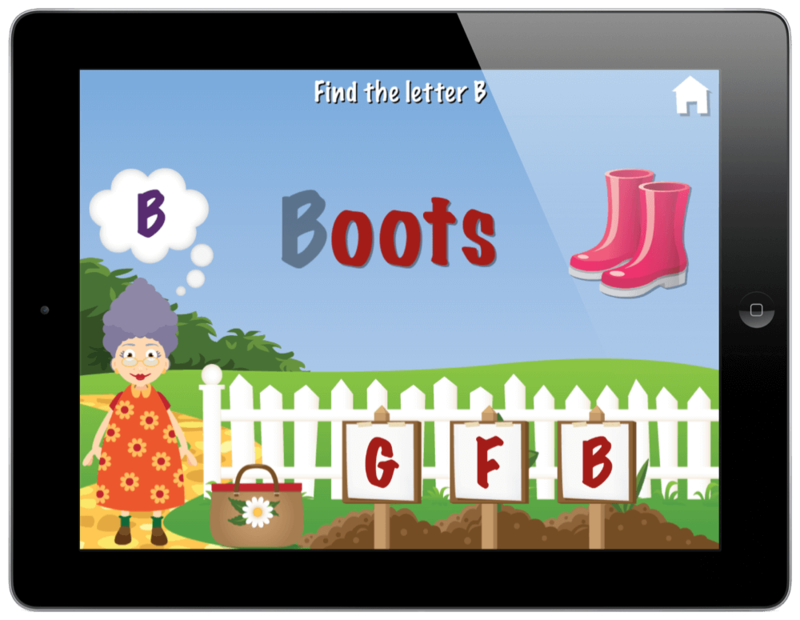 This fun learning app has a wide range of learning activities.